Several years ago there was a book fair in Hanoi where two prized dictionaries - “Annammiticum Latinum Dictionarium” and “Latinum Annammiticum Dictionarium” – came up before the judging panel. 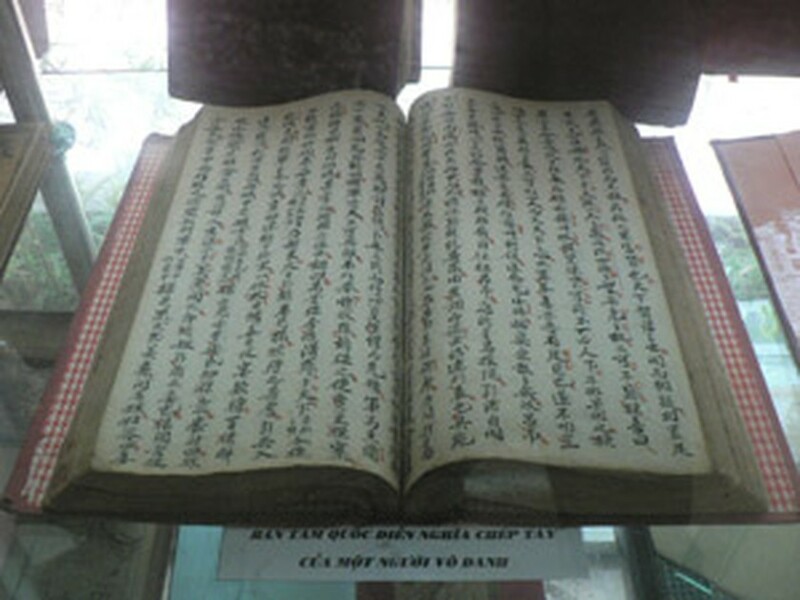 A handwritten version of the Chinese classic novel "Romance of the Three Kingdoms"
They had been compiled by the French priest Pigneau de Behaine, who had later given them to a fellow priest named Taberd in India in 1838. Since then they have been known as the Taberd Dictionaries. “In my life, I never dreamed I would one day hold those two books in my hands. It was unbelievable,” remembers Mr. Nguyen Quang Tuan, the bibliophile who chaired the judging panel that day. Time moves on, collectors die and others take their place, but one thing remains constant: the passion for owning books. What sort of books they like to possess varies from one to the next; some like collecting rare editions while others simply like to collect their favorite authors only and care not one whit for market value. Fellow Hanoians Nguyen Dinh Thi and Vu Bang can be counted in the latter category. 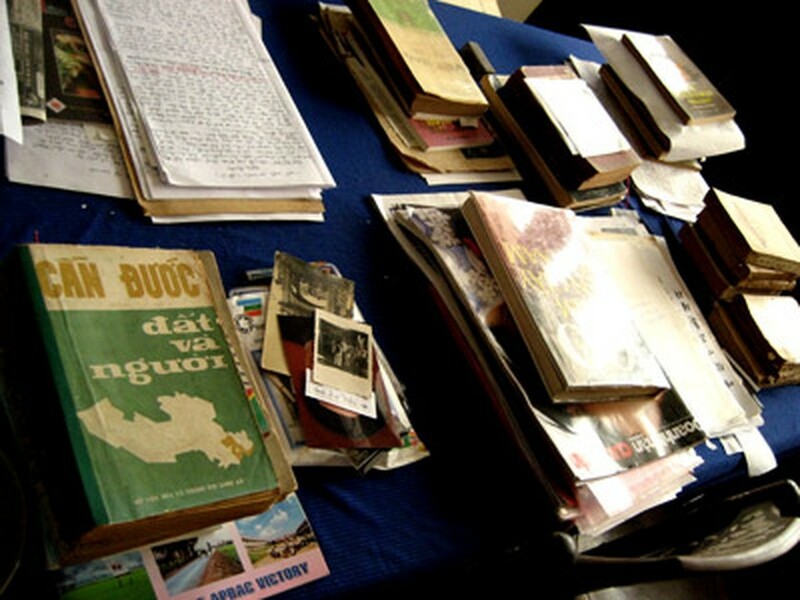 Then there’s Mr. Bong of Hang Buom Street, who collects the original manuscripts of renowned writers like Nguyen Tuan, Nguyen Huy Thiep and Phung Quan. A version of "Romance of the Three Kingdoms"
Some Hanoian collectors have a yen for those books where the pages are made of something other than paper. One such is the artist Thanh Dam, who owns a book of verse and pictures titled “Our Country’s History” that was penned by Ho Chi Minh and published in February 1942. The one-in-a-million book has only 16 pages, each measuring nine by thirteen centimeters and made of very fine slate. 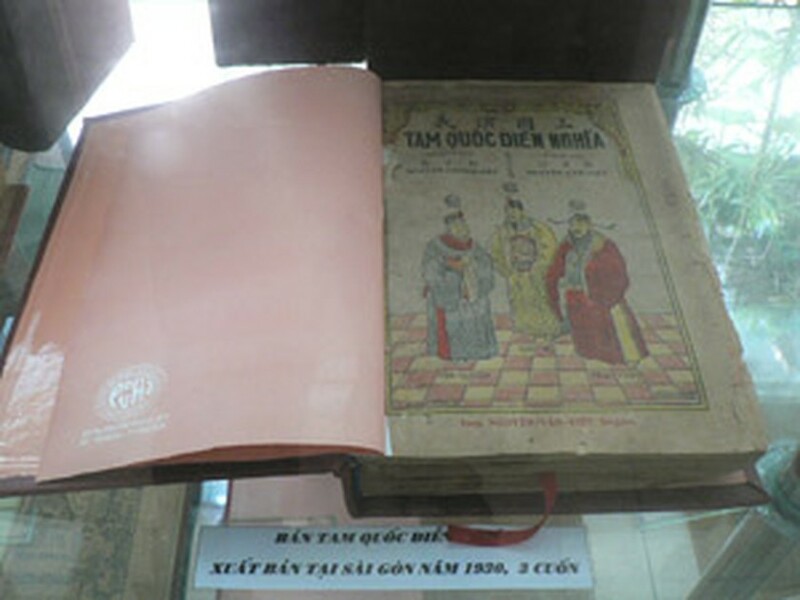 On them are etched many illustrations of historical characters like De Tham, Bui Thi Xuan, Hai Ba Trung, Ly Thuong Kiet, Tran Hung Dao and Tran Quoc Toan done by Ho Chi Minh himself. Thanh Dam also possesses lantern-shaped and egg-shaped books as well as books that have “sliding doors” and look like a stage. On a trip to Laos some time back, Dam bought a book with pages made of leaves and where the words and pictures had been etched with a needle and finished off with a mixture of Chinese ink and fish gall. For their unique leaf books, the Khmer people of Cambodia and southern Vietnam like to use square-cut palmyra leaves, which are stigmatized with a needle and cooked until they turn a ripe yellow. After airing and drying, the pages get an application of loess color or Chinese ink and are covered with a kind of oil to keep out moisture and deter the worms. These are also sought by collectors. But the biggest scoop was by a northern-born resident of the south. HM, as he calls himself, went to Da Lat in the Central Highlands and managed to get his hands on two books written over 350 years ago by Alexandre de Rhode, the brilliant French Jesuit who introduced the Roman alphabet to Vietnam in the seventeenth century. Everyone agrees the two books are very valuable, while book collectors and international auction houses categorize them as “extremely rare”. HM must be one happy collector. Anyone interested in a Vietnamese slant on the subject should read “The Fun of Collecting Books” by Vuong Hong Sen, a long-time collector of books and antiques who lives in Ho Chi Minh City.